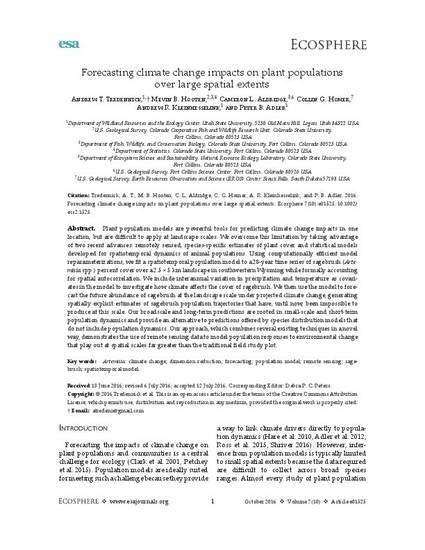 Plant population models are powerful tools for predicting climate change impacts in one location, but are difficult to apply at landscape scales. We overcome this limitation by taking advantage of two recent advances: remotely sensed, species-specific estimates of plant cover and statistical models developed for spatiotemporal dynamics of animal populations. Using computationally efficient model reparameterizations, we fit a spatiotemporal population model to a 28-year time series of sagebrush (Artemisia spp.) percent cover over a 2.5 × 5 km landscape in southwestern Wyoming while formally accounting for spatial autocorrelation. We include interannual variation in precipitation and temperature as covariates in the model to investigate how climate affects the cover of sagebrush. We then use the model to forecast the future abundance of sagebrush at the landscape scale under projected climate change, generating spatially explicit estimates of sagebrush population trajectories that have, until now, been impossible to produce at this scale.